Please indicate our source www.ecosystema.ru ® if you publish these materials in the Internet. This manual contains a procedure for the route census of fungi, fields study design and laboratory processing of collected samples, including determination of species, estimation of fungi stock as well as classification of fungi according to edibility and toxicity. Students collect of fungi, census populations and describe habitats. This field study has instructional video featuring real students conducting the ecological field techniques in nature. Each video illustrates the primary instructional outcomes and the major steps in accomplishing the task including reporting the results. Fungi belong to a large group of living organisms (about 65,000 species), which is defined as a separate kingdom, Fungi: (Mycota, Mycetalia). They are characterized by both plant features (immobility, unlimited growth, ability to synthesize vitamins, cell walls, and feeding through absorption of food) and animal features (presence of chitin in cell walls and urea in metabolism, storage of carbohydrates in the form of glycogen, but not starch; absence of starch and heterotrophic nutrition, i.e. obtaining carbon from organic substances produced by other organisms is necessary for development and growth). The kingdom Fungi consists of two divisions: Slime fungi or Myxomycetes (Myxomycota) and True fungi (Eumycota). True fungi include eight classes; according to structure of spawn (mycelium), they are divided into microscopic fungi, in which the mycelium consists of one (sometimes very long, up to several dozens of centimeters) multinuclear cell, and higher fungi with multicellular mycelium. At this lesson we will focus on studies of higher fungi. Most fungi are microscopic organisms that are not seen with the naked eye. Such fungi are called Micromycetes. Results of their functioning include the destruction of various materials, spoiling of food products, various molds and mildews. 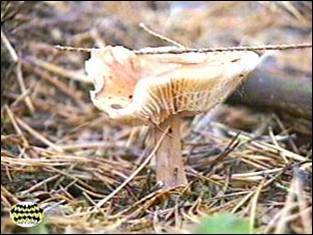 Other fungi, which are not so numerous, form noticeable fruiting bodies; such fungi are called Macromycetes. They will be discussed below. Let us briefly list some peculiar features of fungus structure and growth before describing a research procedure for fungi. The spawn of higher fungi, which grows and performs functions of nutrition, respiration and reproduction, is called mycelium. It is a dense interlacement of thin ramified threads (hyphae), which are about 5-10 microns thick. Mycelium grows radially in all directions with a rate of about 10-50 cm a year. The lifespan of a spawn of higher fungi reaches 10-25 years and even more (up to several hundred years). Mycelium grows from spores or separate pieces of mycelium, which fall into favorable conditions in soil at the depth of about 5-15 cm or on other substratum, for instance, on wood. A dense interlacement of hyphae forms fruiting bodies, that we call mushrooms. The fruiting body is a reproductive organ, which stands out above the substratum surface. Its functions include development, protection and dispersal of spores. Fruiting bodies are formed on the ends of actively growing spawns in groups, so when the central part of the spawn dies off, some species of fungi form well-visible rings of fruiting bodies – so-called “fairy rings," which can be from three up to 50 meters in diameter. Macromycetes, higher fungi, which form fruiting bodies and are found in forest litter and on wood, will serve as objects for study in this lesson. The amount of their representation in the area of study, as well as the availability of “labor resources” will determine whether to study one group of fungi or both of them. If ground forms of fungi dominate in your area and the size of the students’ group is not large (up to 10 pupils), it is possible to restrict the study to research of the mentioned fungi, with the exception of wood fungi. If there are many wood-attacking fungi in the forest and many students’ groups are available, then some of the research can be devoted to the study of wood-attacking fungi. In any case, the research team will have the following tasks: 1) to compile a list of fungus species found in your area that is as complete as possible; 2) to determine population density of different fungus species in different biotopes; 3) to identify environmental conditions typical for the most abundant or most valuable (for example, from a food point of view) fungus species. Material for completion of the mentioned tasks is collected simultaneously in the course of fieldwork. It is possible to purchase the complete set of 40 seasonal Ecological Field Study Materials (video in mpg + manuals in pdf formats) in an attractive 4 compact disk set. These compact disks are compatible with Mac and PC computers. The teacher background information and manuals can be printed out for easy reference. The videos are suitable for individual student or whole class instruction. To purchase the complete 4CD set write to ecosystema1994@yandex.ru in a free form. Some of these manuals you can also purchase in the form of applications for Android devices on Google Play. We also have a free and interesting demonstration disk that explains our ecological field studies approach. The demo disk has short excerpts from all the seasonal field study videos as well as sample text from all the teacher manuals. The disk has an entertaining automatic walk through which describes the field study approach and explains how field studies meet education standards. You can also download the Demo Disc from ecosystema.ru/eng/eftm/CD_Demo.iso. This is a virtual hybrid (for PC and Mac computers) CD-ROM image (one 563 Mb file "CD_Demo.iso"). You can write this image to the CD and use it in your computer in ordinary way. You also can use emulator software of virtual CD-ROM drive to play the disk directly from your hard disk.